Vetiver is a native perennial from India a bunchgrass of the Poaceae subfamily. The vetiver grass has been known to grow up to 3 meters high. The roots of Vetiver grass grows downward resulting in the roots getting as far deep as between two – five meters. Of course, these results are under perfect conditions. However, I personally have noticed that these magnifying results are not as common in clay soil. I am continuing my series on water purification, and more deeply in the Phytodepuration plant’s section, so I also want to mention that there are many purposes for Vetiver grass. More than just a water purification system it also, stabilizes soil and prevents further soil erosion, oils are extracted for many products including cosmetics and aromatherapy, medical properties for treating skin, helps block rainwater runoff, used for a natural pest repellant and crop protection, animal feed, and soil remediation. Additionally, vetiver can be used as a great wind block, can be used to reduce wildfires, a high-quality mulch, and a biomass for energy production. This was an experimental pilot to discover the effectiveness of vetiver grass in the uptake of contaminants from two water samples. 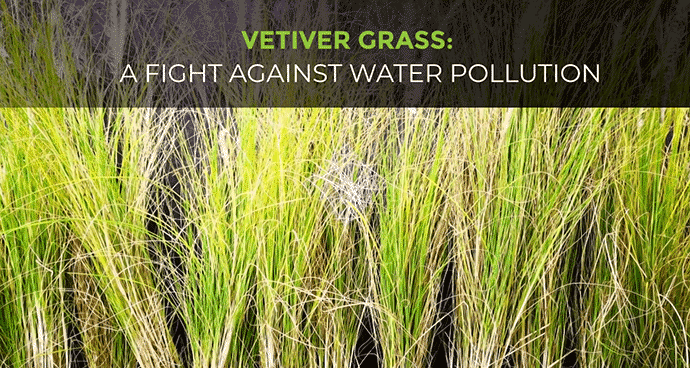 The vetiver grass was planted in a hydroponics system to try to purify the water from two different samples. Sample one: saline groundwater was from wells located around the mine area. Sample two: Although waters from the Golgohar mining site are not permitted to escape into public waters, and the aim of the current research was to examine the efficiency of the vetiver system in the reuse of water for processing plant, this study just focused on salinity and thus the total dissolved solids (TDS), electrical conductivity (EC), total hardness (TH), anions (SO4, Cl) and cations (Na, K, Mg, Ca) were considered and analysed. The last two paragraphs were directly from our cited reference. I wanted to reflect on their research and bring a case study to report my thought process on the topic. You can also find the whole PDF and study in its entirety by clicking on the above link. With water pollution continuing to pollute our water supplies, chemicals from unsustainable industrial practices are overwhelming our natural ecosystems. Fish, soil, plant life, even human life is deteriorating in front of our very own eyes because of the chemical build up and lack of nutrients. The nitrogen, phosphate, lead, mercury, arsenic and other chemicals that are in our water and soil, we are ignoring. I have personally used both Bamboo and Vetiver. However, this year my experience with vetiver plant wasn’t as successful, And I lost quite a few plants. Within any Agriculture or Permaculture system, there is a chance of not having a successful yield for an unexplainable reason. I am still going to push forward and continue using vetiver because I believe in this system! Furthermore, I believe in a system that reuses our greywater and purifying additional water supplies. We need to Recycle and Reuse our greywater. We need to make better sustainable choices when it comes to our natural resources our water supplies, our energy supplies! All of these our in the Permaculture Principles and a big part of Permaculture Design.